This is Wayback Wednesday, your midweek blast from the past! In this feature, we dig into the archives, look back at the history of basketball gaming, and indulge in some nostalgia. Check in every Wednesday for retrospectives and other features on older versions of NBA Live, NBA 2K, and old school basketball video games in general. You’ll also find old NLSC editorials re-published with added commentary, and other flashback content. 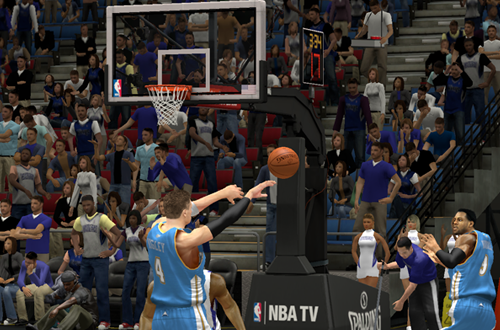 This week, I’m taking a look back at my memorable MyCAREER game in NBA 2K13. I’ve been playing basketball video games for more than two decades now. There are two main reasons that I remain a fan of the genre: I’m passionate about the sport, and I’ve had so many fun experiences with both sim and arcade basketball games over the years. I’ve previously compiled a list of some of my favourite experiences, one of them being my MyCAREER game in NBA 2K13 PC, in which I played for the Denver Nuggets. An enjoyably successful rookie season with some interesting twists and turns set the bar high for future games, and indeed, it hasn’t been until this past year with NBA 2K17 that I’ve had a similarly great experience with MyCAREER. As I’ve said many times in the past, I’d traditionally describe myself as a franchise gamer. I remember being blown away by Franchise Mode in NBA Live 2000, and it remained my mode of choice through its rebranding into Dynasty Mode in NBA Live 2004. Meanwhile, NBA 2K was doing some great things with Association mode, and when I finally got into the 2K series, I enjoyed checking all that out. A lot of basketball gamers were keen to see a fully fledged single player career mode though, and when My Player debuted in NBA 2K10, it was a big step forward for the game. I could understand the appeal, but still, franchise modes were of more interest to me. I did give the career modes a look though, and ended up playing a few games of My Player in NBA 2K12. Although I ultimately didn’t get very far, for the first time I did find myself thinking “Hey, this is actually pretty fun!” At the time however, I was still grappling with Isomotion controls. Combined with the low starting ratings, I had trouble putting up numbers and earning more minutes, which led me to abandon the mode. Come NBA 2K13, right stick dribbling controls were introduced, and suddenly the game felt a lot better to me. I tried out the newly rebranded MyCAREER mode ahead of writing my NBA 2K13 review, and ended up sticking with it. After a so-so performance in the Rookie Showcase game, the Denver Nuggets drafted me 20th overall. I’d created a 6’4″ shooting guard, slightly boosting my real height of 6’3″ and choosing a more appropriate position than centre, which I’d played in the local junior league. I found myself on a team that included Ty Lawson, Andre Miller, and Andre Iguodala, so it was going to be difficult to find playing time as a guard. Nevertheless, I made the most of my minutes off the bench, honing my stick skills in player locked gameplay, and establishing myself as a decent sixth man. Finally, I found myself in the starting lineup alongside Lawson, with Iggy at small forward. That’s when things took an interesting turn. Ty Lawson suffered an injury that put him out for the entire season, and I suddenly found myself starting at point guard. It came as a surprise because I didn’t actually remember him getting injured in the previous game, and once I’d discovered he was out of action, I figured Andre Miller would be his replacement. Instead, I was called upon to run the point, and I discovered that I liked it a lot more than playing shooting guard. I prided myself on setting up teammates, and racking up assists. I enjoyed it so much that I’ve always chosen to be a point guard in subsequent MyCAREER games, as well as 2K Pro-Am. Lawson’s injury, and the fun I had playing through the rest of the season, is one of the reasons why I’m not a huge fan of the story-driven approach of MyCAREER in recent games. The battle to earn minutes as a rookie, getting a shot at being a starter and then being thrust into the starting point guard role because of an unfortunate injury, and going on to achieve some great things…frankly, that’s all the story I need. The tale was told through the gameplay, with the interactive press conference cutscenes adding some extra flavour and role playing opportunities. I didn’t intend to maintain a story thread when I started that MyCAREER game, but I ended up creating one anyway. Upgrading my player obviously helped, but the more I played, the more I mastered the controls and got a handle on player locked gameplay, and I started putting up some bigger numbers. Double-doubles became commonplace, and I even started to tally some triple-doubles as well. My stats improved as the season wore on, and the wins piled up. 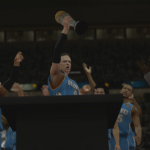 The Nuggets finished with a 73-9 record, and although Andre Iguodala was named the Most Valuable Player, my Rookie of the Year performance had played a role in the team’s success as well. We stormed through the Western Conference in the Playoffs, and ended up facing LeBron James and the Miami Heat in the Finals. The series proved to be my breakout party. Although I was consistently posting some good numbers by the end of the season, my lack of playing time early on dragged down my overall averages, which stood at a modest 10.8 ppg and 10.4 apg. With a clean slate, my Playoff averages were considerably better, and after a big Game 1 in which I scored 31 points to go along with nine rebounds and 19 assists, I knew I could have a big Finals series. 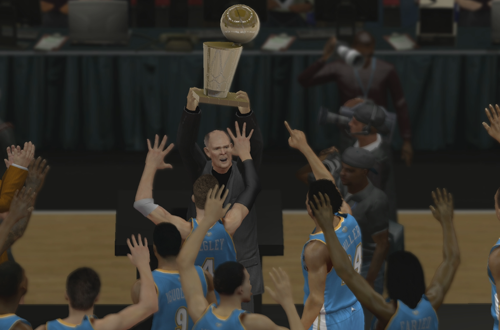 With a line of 27 ppg, 7.4 rpg, 14.6 apg, 1.8 spg, and 1.6 bpg, I locked up Finals MVP honours, leading the Nuggets to their first NBA Championship with a 4-1 series victory. Oddly, Andre Miller was inserted into the starting lineup halfway through the series, moving me back to shooting guard and making it a bit tougher to get assists; that’s another thing that encouraged me to create a point guard in future games. He also didn’t seem to like passing to me, which was weird. Apart from that, I really came to enjoy playing with the 2013 Denver Nuggets. Iggy and Kenneth Faried were adept at finishing inside, while Danilo Gallinari was always good for a few assists gunning away from the perimeter. We had way more success than the real Nuggets did that season, but hey, I was playing in the NBA. Realism was already out the window. Throughout the season, I found myself captivated by the immersive atmosphere of MyCAREER. I couldn’t help but pay attention to the new virtual Twitter, with its combination of accurate observations and stupid remarks…not unlike the real thing, actually. I figured out that tallying at least 10 points, three rebounds, and three assists tended to keep fans happy. I did find myself getting disgruntled with some of virtual George Karl’s remarks when he benched me after making a few mistakes, but given the controversy surrounding his new book, maybe his comments were pretty accurate after all. Once again, combined with the gameplay, those features told the story. I kept playing MyCAREER in NBA 2K13 through the 2013 offseason, and when NBA 2K14 PC came out I eagerly started a new game. I created a point guard and was drafted by the Minnesota Timberwolves, but as I’ve previously discussed, it just wasn’t the same. I was turned off by the story-driven approach in the PlayStation 4 version of NBA 2K14, a feeling that continued through NBA 2K15 and NBA 2K16. 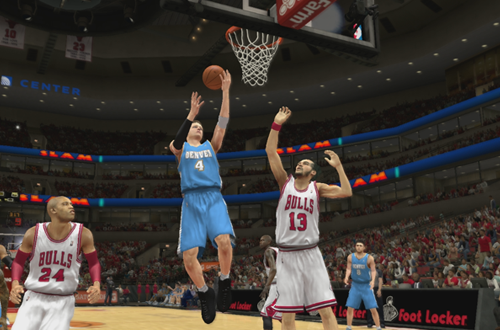 With the greater emphasis on gameplay in NBA 2K17’s MyCAREER mode and a less intrusive story, I finally had a MyCAREER experience that I enjoyed as much as NBA 2K13, once again playing for the Nuggets (and now the Chicago Bulls). No basketball video game is perfect. There are always going to be flaws that bother us, especially the more we play any given title. Still, if there’s a mode that gets you hooked and playing two, three, or even four games in a row when you’ve got the free time to do so, chances are you’re getting your money’s worth. That was definitely the case for me with MyCAREER in NBA 2K13. At heart, I’m probably still a franchise gamer, and with everything that’s been done with MyLEAGUE, it’s a mode I want to play some more of. NBA 2K13 definitely piqued my interest in MyCAREER though, and delivered an experience that’s right up there with my favourite franchise games. Did you ever get a chance to get that “Facebook Dunk package” ? No, I never played the Facebook game. Was it even redeemable in the PC version?